Intense Pulse Light is an advanced light system to restore a more youthful appearance to your skin by treating pigmentary problems, flushing and redness to provide you with healthier, younger looking skin. Studies have proven that when skin samples are examined under the microscope after treatment with IPL the collagen is actually tighter, healthier and arranged in a more uniform youthful pattern. It actually ‘turns back the clock’ for improving collagen when 2 to 3 treatments are done per year. A combination of treatments may be needed for more severe cases. 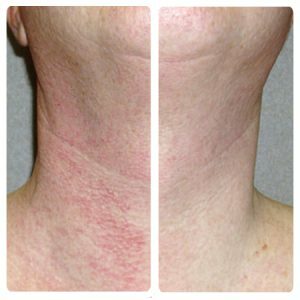 This can be combined with ProFractional Laser and/or Microlaser Peel for more severe damage or discoloration.